We can’t deny that we are getting less active than ever and spending more time sat physically inactive for much of our day either on the sofa watching TV or gaming, or at a computer. This is also the case where we have a physical limitation where sitting isn’t optional making it even harder to be active. But during this sedentary time, it is possible to be more active without having to go to the gym, spend money on equipment or even leave the room and it only requires around 2-3 minutes of that precious sofa time and it’s the TV Ads Challenge. 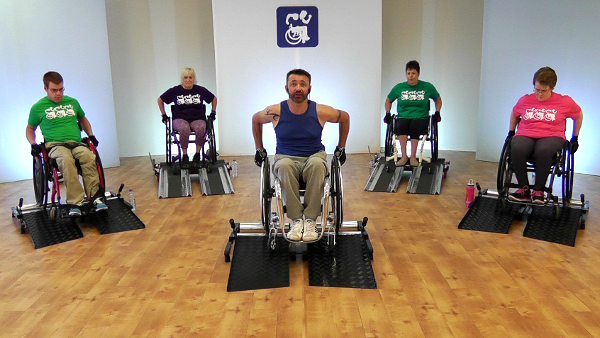 The TV ads exercise challenge is something that everyone can do. Your sat watching a programme and the adverts come – all you have to do is perform one exercise for the complete duration of the adverts and get yourself out of breath. For every 1 hour of TV you watch each day, you need to do one ad challenge so 4 hours of TV = 4 ad challenges. Continue this every day and see how it gets easier over time and gets YOU more active. We have even put a short video together showing you some of the things you could do for the challenge. Film yourself doing your first ad challenge and share it on your social media channel using the hashtag #WheelFitAdChallenge and include a bit telling other about what the challenge is. Be sure to include the link to this article and nominate/tag 10 friends to take on the challenge. Everyone can do this so there’s no excuses – we only need excuses to get out of doing something! A. How can you be too busy sitting watching TV adverts to give your body a break. It’s the only one you have! Q. There’s no adverts on my channel, streaming or gaming. A. NEWSFLASH… there’s a pause button! Q. I don’t know what exercise to do. A. Watch the video we’ve made to give you some pointers. Q. Can I do it in a wheelchair? A. Yes, everyone can do it and where necessary you can do it as a passive/assisted movement. Q. Do I need to see my GP first? A. If you are not used to exercise, have a heart condition, high blood pressure, think you may be pregnant or have been advised not to do exercise by a health professional or any other issues that may be aggravated by exercise, then you should always check that it is safe for you to do any exercise beforehand.